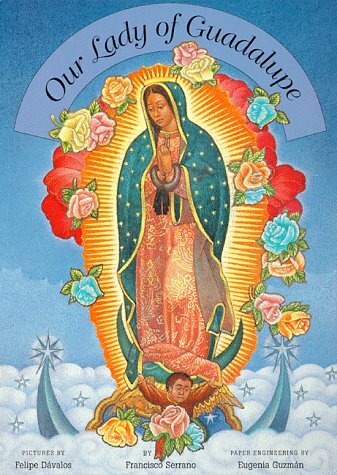 The Virgin of Guadalupe was first seen by a peasant named Juan Diego, one of the first Mexican converts to Christianity, in 1531. Just ten years after the Aztec capital of Tenochtitlan fell to Cortes and his Conquistadors, Diego was crossing Tepeyac hill, formerly the site of an Aztec temple, when he was halted by a blinding light and the viraculous vision of a beautiful dThe Virgin of Guadalupe was first seen by a peasant named Juan Diego, one of the first Mexican converts to Christianity, in 1531. Just ten years after the Aztec capital of Tenochtitlan fell to Cortes and his Conquistadors, Diego was crossing Tepeyac hill, formerly the site of an Aztec temple, when he was halted by a blinding light and the viraculous vision of a beautiful dark-skinned woman who declared herself to be the Virgin Mary, the mother of Jesus Christ. She asked him to persuade the Bishop of Mexico to build a church there. When the incredulous bishop wanted proof, she made roses grow on a hillside in December, cured Diego's uncle, and, finally, presented Diego with an image of herself, miraculously imprinted on his cloak. That cloak now hangs behind the altar of the Basilica of Guadalupe on Tepeyac, which stands to this day as one of the great pilgrimage sites in the Americas. Beautiful, fun, pop-up tells the story of how the Virgin of Guadalupe became Mexico's patron saint. A beautifully engineered pop up book.